The United States gradual fading of two-decades’ sole super power stature is giving way to the blocks solidarity in the global politics. Trump Administration already declared Russian Federation a strategic competitor and claimed that Moscow is attempting to erode American security and prosperity in the twenty-first century. Recently, the US, Canada and other European nations expelled the Russian diplomats in solidarity with Britain. In a quid pro quo Moscow ordered the Western Block States’ diplomats for leaving Russian Federation. Diplomatic expulsions manifest both sides resolve to pursue their political and military objectives in transforming global politics. Since the poising of a former Russian spy and his daughter in Salisbury, United Kingdom, with Novichok, a military-grade nerve agent developed by the Soviet Union during the Cold War, diplomatic tension between the Russian Federation and Western block has gradually been increasing. The latter blames the former for its interference in their internal affairs through the covert operations. Consequently, scores of Russian and Western states diplomats were given marching orders. In solidarity with the British and Americans 29 states had expelled 150 Russian diplomats. 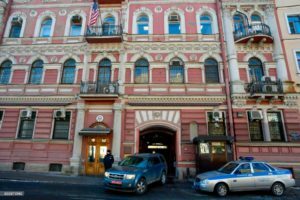 Washington expelled 60 Russian diplomats and closed the Moscow’s consulate in Seattle on the pretext of its proximity to one of its submarine bases and Boeing. 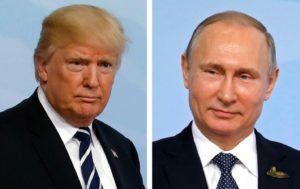 On March 26, 2018, White House Press Release stated: “The United States takes this action in conjunction with our NATO allies and partners around the world in response to Russia’s use of a military-grade chemical weapon on the soil of UK, the latest in its ongoing pattern of destabilizing activities around the world.” Precisely, Americans are convinced that Russians are spying on their ter ritory. The Russians responded immediately. 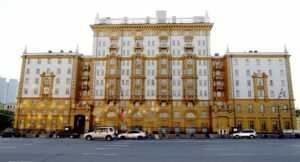 They expelled 60 American diplomats and closed the US consulate in St Petersburg. This underscores that Russian Federation, today, is not a declining regional power in its near and abroad. It is reforming and modernizing its armed forces. During the last decade, Russians demonstrated that their military might is more than capable of holding ground in their historic backyard, projecting power to other adjacent regions. Russians captured two Georgian regions—Abkhazia and South Ossetia—in 2008 and also annexed Crimea in March 2014 without any considerable resistance. Since November 2015, the Russian fighter jets (Su-57) have been bombing antigovernment rebels to bolster Syrian government forces. Moscow’s entry into the conflict does not only alter the battleground realities in Syria, but also boosted Russia’s image in the global military affairs. The North Atlantic Treaty Organization (NATO) is facing a serious dilemma. Both Georgia and Ukraine were its partner states. According to the NATO charter, it is not the responsibility of the Organization to defend militarily its partner nations. However, the NATO members cannot ignore the domino effect of the annexation of Crimea. Conversely, NATO’s adequate contest, irrefutably, set off a hot war that escalates out of control in either Syria or in Ukraine. Hence, the NATO countries are contemplating whether to capitulate or increase their defense spending to combat effectively their assertive peer competitor. The UN secretary general opined that the situation is identical to: “what we l ived during the Cold War”. Whereas, many international relations experts seem confident that Cold War would not return. Michael Kofman, a senior research scientist at the CNA Corporation and a fellow at the Wilson Center’s Kennan Institute opined that: “the Cold War was a competition resulting from a bipolar system, where two superpowers, both with economic and military advantages, were competing to shape international politics. Their universalist ideologies made this competition inevitable, as did the distribution of power at the time.” Admittedly, the causes and character of the current tussle between Moscow and Western block are different, but the strategic competition is identical. The Americans are bent for the strategic containment of Russia. For instance, Moscow expressed serious concerns over the 2018 US Nuclear Posture Review. It claimed the Review lowers the bar for the use of nuclear weapons. Nevertheless, Russians are advancing their nuclear arsenal to counter the Americans military might. On March 30, 2018, Kremlin conducted the successful test of the intercontinental ballistic missile (ICBM) called RS-28 Sarmat, which NATO has called ‘Satan 2’. The Sarmat will replace the current aging Soviet-era ICBM called Voyevoda. Precisely, the pace of the modernization of Russian nuclear weapons, missile and anti-missile systems and conventional armaments confirms that Moscow is determined to sustain the strategic equilibrium with the United States. To conclude, the Western bloc’s diplomatic reaction may only amplify tension between the Great Powers and intensify arms race between the Russia and US. It only maintains political unity in the Western bloc without militarily forcing Russia to stop or retire from global politics in general and Syria in particular and also capitulate Georgian provinces and Crimea in the near future. The writer is Associate Professor, School of Politics and International Relations, Quaid-i-Azam University, Islamabad & Member Advisory Board at ‘Mélange int’l Magazine’ and Center of Pakistan and International Relations (COPAIR).